A pupil of Tatiana Nikolayeva, Nikolai Lugansky can look to pianists such as Sviatoslav Richter and Emil Gilels as his forebears. He was the winner of the International Tchaikovsky Competition in 1994, and he won or placed highly in other important competitions before then. For Warner Classics, he has already recorded Rachmaninoff's Piano Concertos (0927-47941-2 & 2564-61946-2) and a selection of preludes and Moments musicaux on Warner's Erato label (8573-85770-2). It was a clever idea to place all three of Rachmaninoff's large sets of variations on a single CD (in descending order of popularity and familiarity). The Paganini Rhapsody needs no introduction. The Corelli Variations are based on "La Folia," a theme used in several works from the Baroque period. Actually, the theme is from Portugal and not "of" Corelli at all, although Corelli made particularly good use of it in a composition of his own. When this fact was brought to Rachmaninoff's attention, he agreed to strike Corelli's name from the music's cover – but not from its title page! Nevertheless, the work has been known as the Corelli Variations ever since. The Chopin Variations are based on the C-minor Prelude from the Polish master's Op. 28 collection. This is the same prelude that Barry Manilow used as the basis of the song "Could it Be Magic?" in the 1970s. Lugansky eschews the ultra-muscular style of playing sometimes associated with the Russian tradition – again, Richter comes to mind – but there's still plenty of strength and assertiveness associated with these readings. With familiar repertoire, there is a danger that only extremes will impress, yet Lugansky seems to have little desire to push the music like a used car salesman. His technique serves the music, not his ego. Intelligent moderation still has its place, it would seem. His fingers have no problem disentangling Rachmaninoff's knottiest pages, and his tone is beautiful but not precious. It can be difficult to make the long solo sets hang together – at 30 minutes, the Chopin Variations are especially challenging – yet Lugansky's readings never lose momentum. 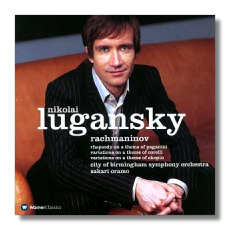 In the Paganini Rhapsody, Lugansky has an excellent partner in Oramo, one of the latest Wunderkind conductors to come from Finland. The recordings were made in Birmingham and in Berlin, and the quality of the engineering is outstanding from both locations. Jeremy Siepmann's excellent booklet notes add to the value of this recording. This is one for all the piano fans out there.